Presentation: Dev logos screen, Title Menu, "Thanks for Playing" screen, Level Select menu, Staff Credits, and Continue screens. Mania Demo: Access to the Green Hill Zone and Studiopolis Zone demos playable at the 25th Sonic Anniversary Event. 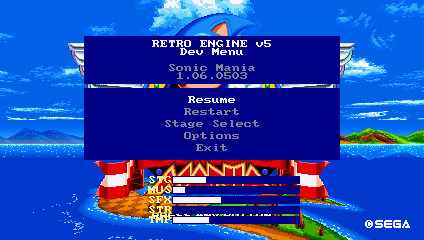 Mania Mode: A separate level select screen. Blue Spheres: Access to any Blue Spheres stage, including options for 'Random' and 'Random 2' which chooses a random Bonus Stage from original and Mania mode, respectively. Extras: Allows selection of Puyo Puyo mode and the D.A. Garden. Cutscenes: A list of the cutscenes in the game, which can be jumped to. Videos: The various ending animations. 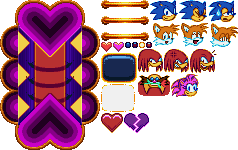 These are sprites of an unused slot machine, found by Dolphman of The Spriter's Resource. It could have funtioned similarly to Casino Night Zone's slots. Maybe the player could hop in and be paid, or robbed of, rings depending on how many Amys or Robotniks they get. There are four unused Blue Spheres layouts in the game that cannot be accessed via the Dev Menu. The only way to access these is to rename their SpecialBS files. This page was last edited on 13 August 2018, at 17:07.